This won't be one of my more chatty posts, I have a nasty case of something and feel awful! whatever it is, I caught it from Matt. (thanks Matty!!) I noticed the other morning while I was getting him ready for school that he is very hoarse. Matt is non-verbal but he does make noises and vocalize quite a bit. He came right home and went straight for the bedroom after school and thru the day yesterday I just felt worse and worse. Lots of coughing, sinus pain and pressure and every muscle in my body hurts from the coughing. Hopefully it won't last long! Send me some feel good vibes!! I'm a mom of five, I don't have time to be sick!!! 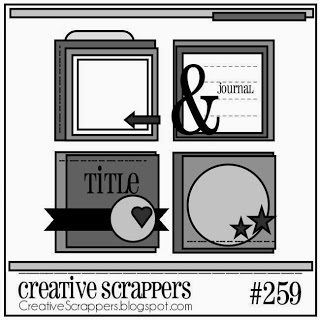 I decided to play along with sketch #259 from Creative Scrappers, I love the layering and the fact that this layout came together really quickly. It's a keeper!! I can see the look for this changing depending on the types of papers and embellies you use. 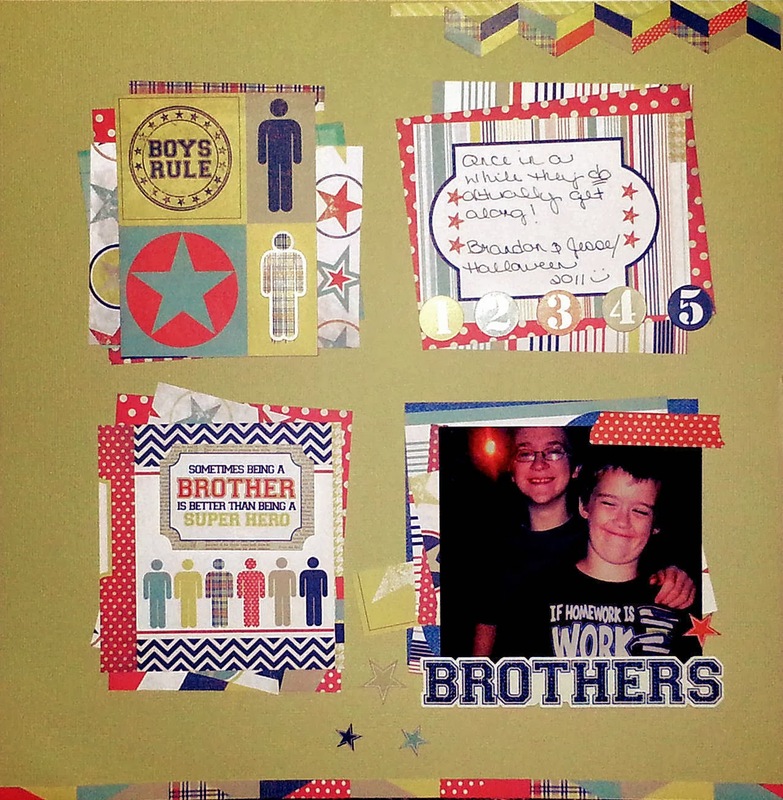 I used a bunch of scraps from Echo Parks "Brothers" collection. The photo really doesn't do the layout justice. I just layered a buncha bits together and stapled them and then adhered to the kraft stock. The top layer on each one is adhered with double sided tape. Thanks for dropping in today! I told ya this was gonna be a short post.....lol. I have another layout that I am almost finished with that I hope to get around to sharing tomorrow. All that's left on it is gluing down my chipboard title. Just sitting her typing this wore me out....lol. Sorry you aren't feeling well! I loveeeeeeeeeeee your lo!! LOVING the colors and that grid design!!!! This is such a fabulous page! Love the layers and colors!